Bob Olson explains the pros and cons of predictions in readings. 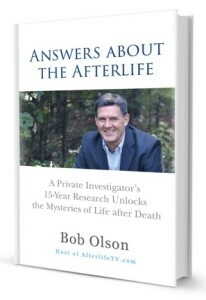 A former skeptic & private investigator, and the author of ANSWERS ABOUT THE AFTERLIFE: A PRIVATE INVESTIGATOR'S 15-YEAR RESEARCH UNLOCKS THE MYSTERIES OF LIFE AFTER DEATH, Bob Olson has been an Afterlife Investigator & Psychic Medium Researcher since 1999. In his search for evidence of life after death, Bob has tested hundreds of psychics, mediums & other afterlife-related practitioners. Bob is the host of AFTERLIFE TV, founder of BEST PSYCHIC DIRECTORY and BEST PSYCHIC MEDIUMS, and offers his PSYCHIC MEDIUM WORKSHOP to help psychics and mediums improve their abilities and business. Visit Bob on AFTERLIFE TV's FACEBOOK page & on TWITTER.